The clouds of sugar and flour have settled over here after Dessert Week Aught Eight, and in its wake, today’s post is just what the doctor ordered. After sweetness and decadence for five straight days here at The Kitchen Sink, it’s time for something a bit more austere, I think. I mean, I love desserts as much as the next gal, but after so many in a row, I was craving the punch of sharp acidity and bite that this recipe for crisp, pickled vegetables delivers. The truth is, I was on the hunt for a pickled vegetable recipe long before last week’s sugary binge. My pickle infatuation might start with crisp dill pickle spears, but it doesn’t end there. I also have a weakness for other vegetables, marinated in potion that are various parts sour, salty and sweet. I think pickled vegetables are lovely served along side meats and cheeses on an antipasto platter, heaped next to a slice of quiche for brunch, or eaten on their own as a light lunch or snack. But I never found a recipe that looked quite right. Until I saw this recipe in the April issue of Food & Wine. I was intrigued by the vast, colorful array of vegetables (no fewer than six, ranging from peppers to fennel), the inclusion of two types of vinegar (white wine and cider) and the clever combination of flavorings (garlic and peppercorns, but chiles, julienned ginger and coriander seeds too). I had to make a couple modifications to the recipe (I used fennel and caraway seeds in place of coriander seeds; pickled hot peppers in place of rehydrated guajillo chiles) and I’d probably make a couple others next time around (namely, reducing the amount of sugar, as it was a bit too sweet for my taste). That said, the two-day marinade achieved the perfect texture in the vegetables (yielding, but still crisp) and a wonderfully piquant harmony of flavors. 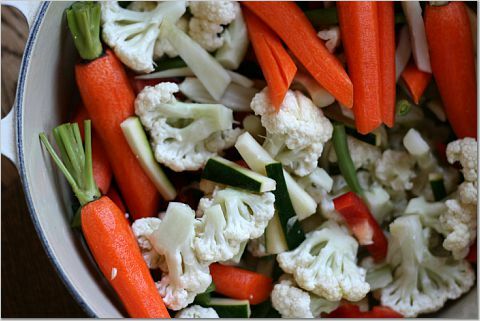 In a large, deep, nonreactive bowl or heatproof glass jar, combine the cauliflower, carrots, fennel, red bell pepper, zucchini and beans. In a medium heatproof bowl, cover the chiles with boiling water and let stand until softened, about 10 minutes. Drain the chiles and transfer to a large saucepan. Add the cider vinegar, white wine vinegar, sugar, salt, coriander, peppercorns, ginger, bay leaf and garlic. Add 3 cups of water and bring to a boil, stirring to dissolve the sugar. 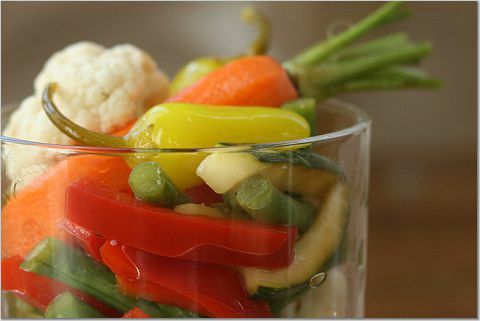 Pour the hot liquid over the vegetables and cover with a plate to keep the vegetables submerged. Let cool to room temperature, then cover with plastic wrap and refrigerate for 2 to 3 days. Drain the vegetables and transfer to a large platter. Drizzle with olive oil, garnish with the parsley and chives and serve. * I used already pickled hot peppers in lieu of the rehydrated guajillo chiles. ** Next time, I will reduce the sugar to 1/2 (or maybe even 1/3) cup. *** I used an equal combination of fennel and caraway seeds in place of coriander seeds. I didn’t understand that pickled vegetable salads could actually be good until I moved to eastern Europe. They’re fab! I’m glad to see such a lovely recipe for one posted on your blog. Long live vinegary carrots! 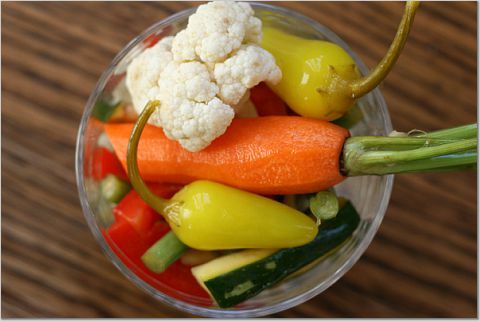 Love pickled veggies! I haven’t tackled my April Food & Wine yet, but I’m glad to see you have! I love pickled vegetables. Well, I love pickled anything really! They look really delicious. Oh my gosh, this looks so good my mouth is watering! I MUST try this! RecipeGirl: You might recall that I had some terrible flight delays the weekend before last. In other words, I tore through all the March and April food magazines in under three days. Now I have to way another month. Sigh.